Not only is Iceland known for its volcanos, geysers and glaciers, it is also known for its love affair with books. It claims the highest number of book written, published and sold per capita in the world. Statistically one in ten Icelanders will be published during their lifetime. I wanted to buy an Icelandic book while I am in the country of fire and ice. I did - sort of. The sort of - it is sort of Icelandic. 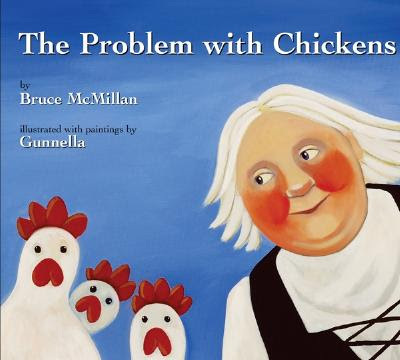 The story takes place in Iceland, Gunnella, the illustrator, is an Icelandic artist, but Bruce McMillan is an American author. But he has written 9 books that take place in Iceland, and often spends the summer there. In a small village on the far end of Iceland, there were plenty of eggs, even if there were no chickens. The ladies in a small Icelandic village have a problem - the birds lay eggs in nooks on the side of steep cliffs, and they cannot reach them. They solve this problem by getting some chickens. But soon the chickens decide that they want to be like the ladies and not like chickens. Eventually they stop laying eggs. The Icelandic ladies solve this egg conundrum in a fun and light-hearted way. I like Bruce McMillan's text; is is clean, light hearted and fun, if requiring significant suspension of disbelief. But I love Gunnella's illustrations. It seems as if I am not the only one. Author, Bruce McMillan saw a series of Gunnella's paintings, and made up the story around them. 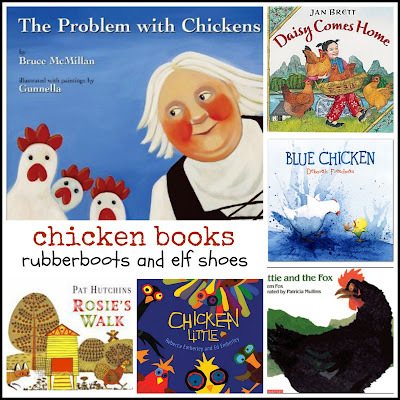 The Problem with Chickens won a New York Time Best Illustrated Book Award. 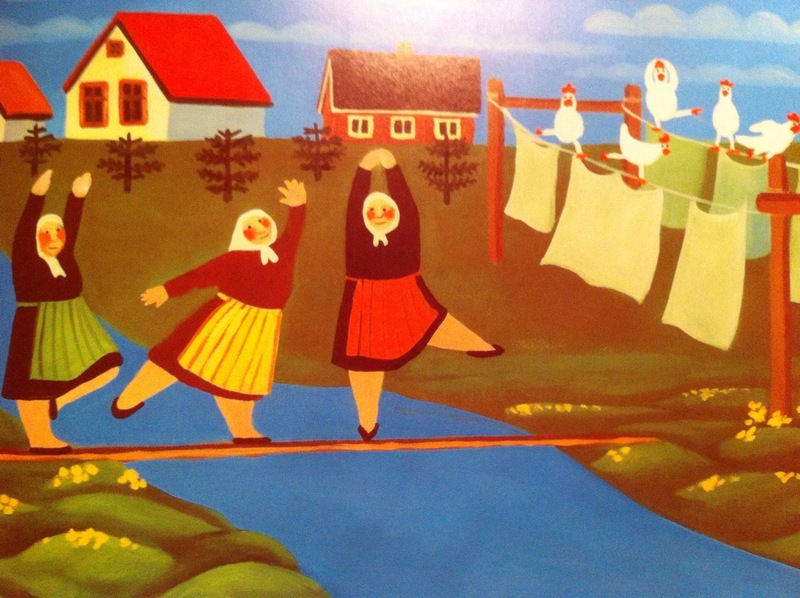 The folk-art style oil paintings complement the story perfectly. 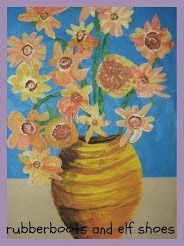 Horn Book Magazine states that the paintings have "verve, vibrancy and humour". They made me laugh. 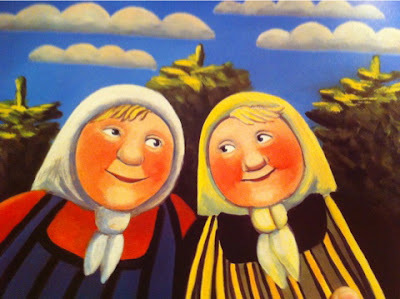 The old Icelandic women are delightful, and the chickens - well, they are just plain old funny. Learn a wee bit about Iceland: Iceland facts for kids. 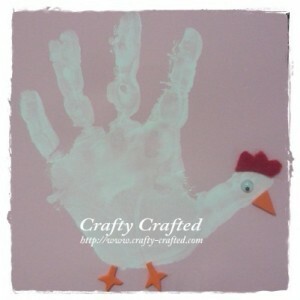 This handprint chicken from Crafty-Crafted does not seem to have any problems. And it's pretty cute. Check out some other excellent (deliberately not "eggs-cellent") chicken books . Brush up on your Icelandic. Why does your blog look so beautiful? Did our mutual friend make some fabulous detail changes? I noticed. Your trip sounds so dreamy. If I didn't like you so much I'd be seething with jealousy. As it is, I shall soak up your fantastic ideas now that I can use them in my own classroom. So thank you. I do LOVE chickens. 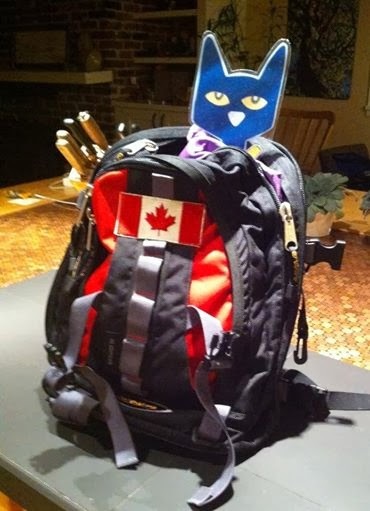 The ever so talented Barb did some end of summer tweaking on my blog. Thanks for noticing. Yay our regional library has this book - will check it out. I think you will love the art work, Maureen. The illustrations are lovely. What a unique book! It was the illustrations that got me. I must get this book. I have a chicken loving second grader that tells us funny stories about his chickens every morning! He'll love it! See if he can beat dancing and tea drinking chickens! Interesting info about Iceland! What a gorgeous folk-style illustrations! Sounds like a fun read for kids. Gorgeous art and fun to read. It's a winning combination. 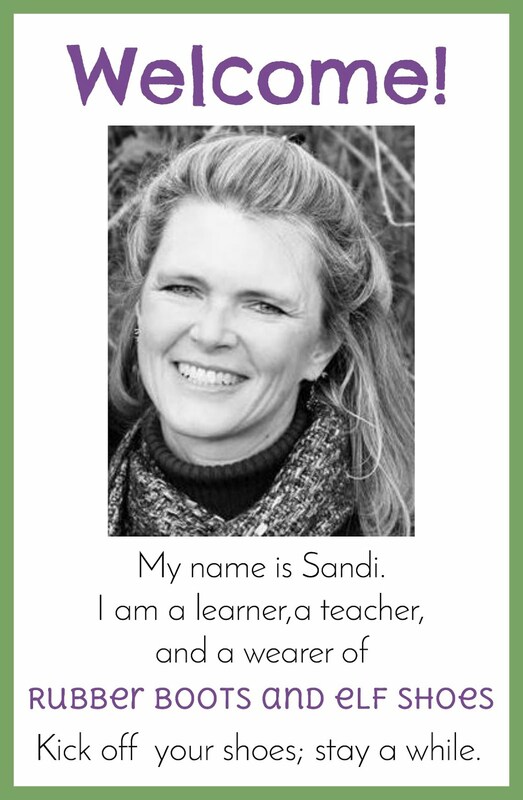 The illustrations are gorgeous Sandi, have to get a copy or 2 next month. I'd almost forgotten about this delightful book, great pick! I think it's worth a second look. looks like a book I need to read - chickens? problems? definitely! It's a fun one - see if your library has it. I love, love, love this book! I did a post about it not too long ago. I really want to get their other books to go with it! You have some fun craft ideas, as always! I wonder if I could make a pawprint chicken?! Thanks for sharing. I hope you had a fabulous trip. oh - what a unique style of book - I love the Icelandic facts and links! Love the Iceland info! I had no idea it was so book-loving! I so hope to visit there someday! The illustrations in this book are amazing. Thanks so much for sharing this on Booknificent Thursday! What a beautiful book and activities! This is a country I know very little about, so I'm glad to learn. Thanks for sharing at the Creative Kids Culture Blog Hop!